It’s interesting how a diagnosis like this affects parents. I have to say first and foremost that I hate the title of the book because I have never thought of diabetes as a death sentence for my child. But after reading it, I can see why it was the right title for Phil’s book about his diagnosis, his childhood, and now his adult life. You see, Phil was diagnosed with type 1 diabetes at seven months. At the time, he was the youngest child to have been diagnosed. Doctors warned his parents that he may not live to see 25 and that if he did he would surely be blind. Sorry to spoil the book for you, but he’s older than 25 and can see just fine. In the book we follow Phil during his childhood, one that was sometimes tough because he’s a bit smaller than his peers and because his father was largely absent. But when he discovers biking, he is transformed. He rides first off road, eventually finding a group of guys who road race. For some reason Phil sees no limits to hold him back. What I found nail-biting as the parent of a young child with diabetes is the freedom he was afforded as a child. He would take off on his bike to who knows where for hours at a time. Maybe it’s more intense diabetes therapies (testing more often, greater knowledge about hypoglycemia, tighter BG targets, easier to use meters, etc.) that cause almost every d-parent I know to NOT let their child have this extreme form of freedom that Phil had. Maybe it’s that these days parents know what can happen, and I’m not just talking diabetes. But maybe it’s also good for us to see that he was off in the Florida wilds and nothing bad happened. I cried several times when reading the book. But they were not always tears of sadness. In fact they were almost all tears of triumph, like the moment that Phil came up with the idea for Team Type 1 and then when he received a large donation that helped get it started. I can’t say I 100% agree with the application of the “Strive for 6.5” goal for children. Yes, it’s good to motivate people with diabetes of all ages to lower their A1c, but the recommendation we have been given for a child my daughter’s age is for it to be below 8.0. So I would personally modify the goal to be the standard that your own endocrinologist suggests for you or your child. Overall, I thought this was a very inspirational and uplifting book that would be a great read for adults with diabetes and parents of children with diabetes who are looking for encouragement that their child can and will succeed at what they set their minds to despite diabetes. And no, I’m still not letting my daughter have that much freedom…at least not yet! If Not Dead Yet interests you, you can actually read the first two chapters by visiting the Team Type 1 website. 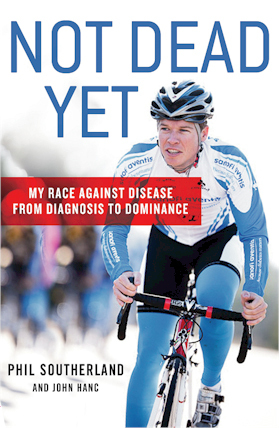 Purchase Not Dead Yet: My Race Against Disease: From Diagnosis to Dominance by Phil Southerland and John Hanc from my affiliate Amazon. I’m actually reading this on my Kindle at the moment! I am liking it a lot so far too. What struck me right away was how he tells readers who don’t know what living with diabetes is like to imagine having to check heart rate or BP constantly and the things that can happen from it not being where it should be. Very good analogy! My next book is Sugarless Plum which is about a type 1 ballet dancer from NYC. I’ve heard good things about it. Great review, I too very much enjoyed the book and was inspired by Phil’s never-ending drive to keep pedaling. The world was different when we were growing up, D or no D. Parents were less paranoid about every stranger being out to kill, kidnap, or molest their children; we all knew everyone on our street, there was always someone at home in every house, the doors were kept unlocked, and any child could count on any parent for help in a crisis. At the same time, parents trusted children to stay out of trouble — and if they didn’t trust some of their child’s friends to be supportive or helpful, they’d limit their child’s exposure to that friend. At the same time, we were expected to be responsible. In a well-sidewalked walking-distance community, mothers expected to be able to call on their children to be able to walk over to the grocery store, buy fill-ins for dinner, and come back with both those fill-ins and the change. Mind you that a part of this depends upon the community in which you live and raise children. If it’s open and people are always outside talking and playing with each other, and you develop relationships with your neighbors and with your child’s playmates, it’s easier to be unconcerned about them being on their own for a few hours than it is if you are living in a high-crime area or an area in which the distances are too far for your child to walk (or bicycle) or if you are in an area in which none of the neighbors speak to each other. Great review! I can’t wait to finish my current book and pick this up!